When many of us view a great building, we are struck by the majesty and artistry that spring from its form, function and materials. University of Notre Dame mathematician Alexander J. Hahn sees all this, but also something more. He sees the mathematics that lies at the heart of great buildings and finds in it a beauty of its own. 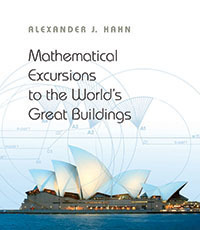 Hahn examines the mathematics at work in great buildings in a compelling and richly illustrated new book, “Mathematical Excursions to the World’s Great Buildings,” published by Princeton University Press. “Mathematical Excursions” discuss the pyramids of Egypt; the Parthenon in Athens; the Colosseum and Pantheon in Rome; the Hagia Sophia; historic mosques; great Romanesque, Gothic and Renaissance cathedrals; some of Palladio’s villas; the U.S. Capitol; and three icons of the 20th century: the Sydney Opera House, the Gateway Arch in St. Louis and the Guggenheim Museum in Bilbao. The idea for the book grew out of Hahn’s long-standing interest in architecture, especially European architecture, and the many informative conversations he has had over the years with his friends and colleagues in Notre Dame’s School of Architecture. “The book intertwines two stories — one architectural, one mathematical — into an interlaced fabric,” Hahn said. “On the one hand, mathematics enhances the understanding of architecture; on the other, the architecture is an attractive stage that makes basic abstract mathematics visible. In order to make the book as accessible as possible, Hahn keeps the mathematics simple. The focus is on mathematics that is central to the basic college curriculum: geometry, trigonometry, properties of vectors, coordinate geometry in two and three dimensions and, at the very end, basic calculus. Originally published by William G. Gilroy at newsinfo.nd.edu on October 17, 2012.